We stock an extensive range of consumable replacement parts for various types and sizes of ram pumps such as ram pumps with ball valves or stalk valves. We stock various parts to other types of pumps other than ram pumps. 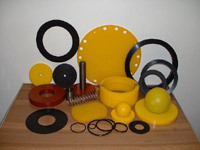 Parts such as flat diaphragms and spherical membranes with various sizes of ball valves and ball valve seats. A wide range and size is stocked of gland chevron sets, gland packing, O rings, gaskets, twinset seals, chevron seals, hypack seals, filters and hydraulic valves. Our range of parts and sizes available for your industrial pumps and power packs is too wide and varied to detail all the parts available.